An effortless meditation for overcrowded minds. Becoming Centered and Balanced Within Yourself is a short meditation that will help you let go of unwanted mental noise and feel more peaceful during everyday life. In this day and age most of us burn up huge amounts of mental energy just trying to get through the day. With so many responsibilities to attend to, tasks to complete and people to communicate with, our attention is drawn in so many different directions at once! For many people, having an overcrowded mind is such a regular part of everyday life that feeling mentally scattered, drained and unbalanced becomes “normal”. Fortunately, becoming centered and balanced within yourself is a completely effortless process, and it really doesn’t require a lot of time. At 12 minutes in length, this is a guided meditation that you can use at any time of day – even multiple times per day. Use it in the morning to get you into a good frame of mind so that you are less likely to be rattled by the day ahead. Use it during the day (on your lunchbreak for example) to clear away mental chatter and emotional irritations. Use it at the end of the day to settle your nerves and let go of any worries that may have built within you, so that you can enjoy time with your family or friends and have a peaceful sleep. This guided meditation is incredibly soothing and requires no experience with meditation whatsoever. There are no special instructions or mental exercises to follow. 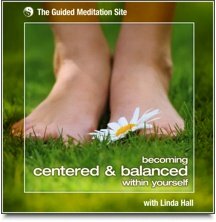 All you need to do is put your feet up and listen as the narrator guides you to let go and relax into a more centered and balanced you. It’s perfect for people who want simple ways to become calm and centered without spending huge amounts of time in meditation. It’s also suitable for experienced meditators who enjoy having a short meditation on hand to bring them back into balance quickly and easily.